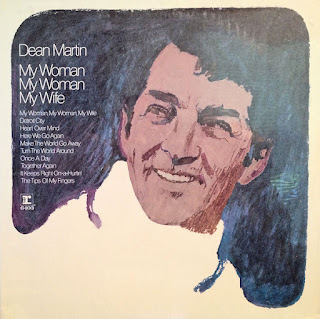 Although the only Dean Martin song to reach the Billboard country singles chart was his "My First Country Song" (1983) (from his Nashville Sessions album), his big country phase actually happened between the years 1969 and 1973. 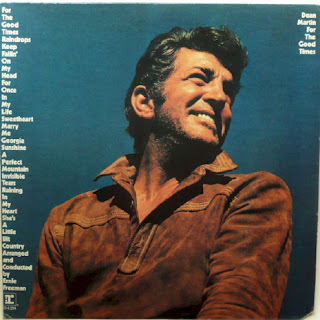 His 1969 version of Merle Haggard's "I Take a Lot of Pride in What I Am" was his final Hot 100 charting single, while his versions of Glen Campbell's "Gentle on My Mind," Marty Robbins' "My Woman, My Woman, My Wife," Bobby Bare's "Detroit City," and Jerry Reed's "Georgia Sunshine" all bubbled under the Hot 100 between 1969 and 1971 (1971 being the year he bowed out of the pop charts for good). This chart activity, though, explains why trade paper op eds expressing worry about certain interlopers sneaking tastes of the country pie would mention his name. 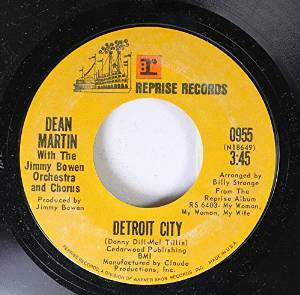 This country aspect of Martin's legacy all makes sense in light of early '70s radio and record industry market calibration, but it does run counter to the Rat Pack Dino persona that prevails in the collective memory. P.S. 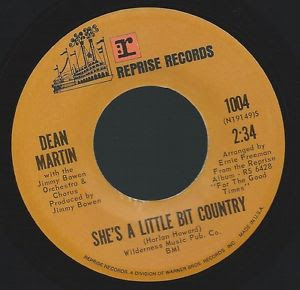 Dino also had a fullblown country phase in '63 which spawned the albums Country Style and Dean "Tex" Martin Rides Again, but no country hits. Marty Robbins's #1 country single "My Woman, My Woman, My Wife" struck all the right chords for the older generation and the traditional mindset of country radio listeners. It delivered a touching message of spousal devotion, including a verse that addressed the couple's pain in enduring the death of their children. "Lord," he sings,"Give her that mansion up yonder, 'cause she's been through hell here on earth... Give her my share of heaven, if I've earned any here in this life." 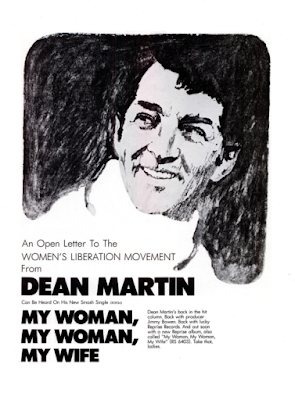 Dean Martin's cover version of the song announced itself with a tone-deaf ad in the June 25, 1970, issue of Billboard, which read "An Open Letter to the Women's Liberation Movement from Dean Martin." What was that all about? Numerous possibilities, both positive and negative, and that was the problem. The country flavor Martin favored during this era manifested itself further on side B ("Here We Go Again"), albeit through a back door: Ray Charles had first recorded the song in 1967 with a soulful B-3 organ, but the track—written by country songwriters Red Steagall and Don Lanier—would have fit perfectly on either of his Modern Sounds in Country and Western Music LPs from the early '60s. Side A: "My Woman, My Woman, My Wife"
Side B: "Here We Go Again"
Dean Martin's version of "Detroit City," with its low tuning-peg guitar riff, just missed becoming the third version of the song to enter Billboard's Hot 100 by bubbling under at #101. (Bobby Bare's version reached #6 in 1963, while Tom Jones's rose to #26 in 1967.) Martin trills his way through Ben Peters's B side. Side B: "Turn the World Around"
"Georgia Sunshine" was a #16 country hit in 1970 for Jerry Reed, who usually used his real name of Jerry Hubbard for songwriting credits. Martin's version adds barroom piano. 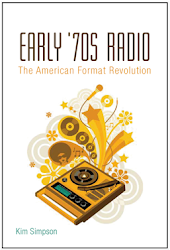 The rendition of the Kris Kristofferson-penned "For the Good Times," a #1 hit for Ray Price, turned the 45 into a "tribute to the country hits of 1970" affair. Side B: "For the Good Times"
Producer Jimmy Bowen and arranger Ernie Freeman went out of their way to keep this composition by Harlan Howard, a stalwart country songwriter, from sounding too much like its title. A version from the same year by George Hamilton IV hit closer to the mark. The "Raining in My Heart" on the flipside is the Boudleaux and Felice Bryant song that Buddy Holly recorded, not the Slim Harpo one. Side A: "She's a Little Bit Country"
Side B: "Raining in My Heart"